Paid apps showing up in Android Market? | Android Blast! Android Blast! 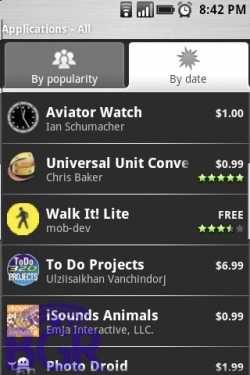 > News > Paid apps showing up in Android Market? Paid apps showing up in Android Market? It appears that some paid applications are showing up in the Android Market. BGR reports if you’re running the latest T-Mobile G1 OS, you’ll see paid applications in the Android Market. They've posted some screenshots so it looks like the paid apps is finally a reality. This is great news for Android.